Bars of OFHC Cu with the diameter of 45 mm were processed by equal channel angular pressing up to 16 passes via route B(c), and homogeneity of their microstructures and mechanical properties was examined at every four passes which develop the equiaxed ultrafine grains. In general, overall hardness, yield strength and tensile strength increased by 3, 7, and 2 times respectively compared with those of unECAPed sample. Cross-sectional hardness exhibited a concentric distribution. Hardness was the highest at the center of bar and it decreased gradually from center to surface. After 16 passes, overall hardness decreased due to recovery and partial recrystallization. Regardless of the number of passage, yield strength and tensile strength were quite uniform at all positions, but elongation showed some degree of scattering. At 4 passes, coarse and ultrafine grains coexisted at all positions. After 4 passes, uniform equiaxed ultrafine grains were obtained at the center, while uniform elongated ultrafine grains were manifested at the upper half position. At the lower half position, grains were equiaxed but its size were inhomogeneous. It was found that inhomogeneity of grain morphology and grain size distribution at different positions are to be attributed to scattering in elongation but they did not affect strength. 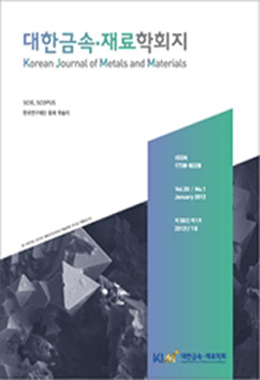 The present results reveal the high potential of practical application of equal channel angular pressing on fabrication of large-sized ultrafine grained bars with quite homogeneous mechanical properties.